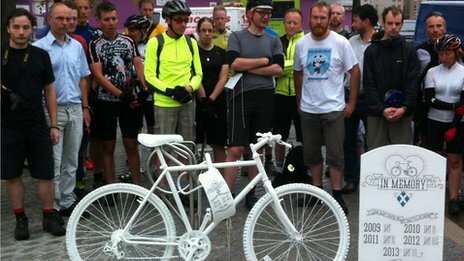 Organisers said the bikes, which are completely painted white, represent the deaths of two cyclists last week. A plaque also details the number of cyclists killed in Scotland since 2009. The demonstration has come the same day as a female cyclist died following a collision with a car on a road near Drumnadrochit in the Highlands. The accident happened on the A831 near the A833 junction at Milton at about 08:41.
prove he or she was not at fault for an incident involving a cyclist. Anecdotal evidence has suggested that this could lead to drivers having more respect for cyclists. seven in 2011 to nine in 2012. Nine people have already died this year. shame them for their inaction." amount being spent in England, outside of London. Scotland, Sustrans and local authorities over this spending review. "Funding of £20m goes directly to local authorities for cycling, walking and Safer Streets projects." He added that there was no robust evidence to suggest strict liability improved safety. regularly brought into conflict with fast-moving traffic. increase investment into safer cycling.